Everybody has their idea of 'The Best' roads here in PA. These posts will cover the BEST roads in PA.... BEST standing for the state forests of Bald Eagle, Elk, Sproul, Susquehannock, Tiadaghton and Tioga. Forests that are in the north-central part of the state, forests that contain the 'PA Wilds', forests that have a rich history of mining and logging, and the small working class towns and people that lived there. All total, these forests contain 1,270,303 acres. That's more than 1 1/2 times the whole STATE of Rhode Island. Last year, I posted some pics of a few rides thru Sproul SF, and they seemed to be well received. So, this year, I won't limit my rides to Sproul, but will try to cover them all. I'll be doing these rides on a DR 650, a Honda ST1300, and will dust off the old BMW R100RT now and then. So, the roads will be everything from 4 lanes to cover ground quickly, to the 2 lanes running up/down/over the mountains and valleys to the gravel forest roads and even a few driveable trails. Well, enough talk, here's pics from today's ride. Let's call the starting point Lock Haven, and today was mainly in Sproul and a few miles in Tiadaghton. In last year's ride, I turned around at the bottom of this road, er 'Driveable Trail'. Today, I ventured down it a bit, then turned around again. First ride of the season and bad knees will do that to ya. Maybe someday I'll ride the whole way? I found these two camps, side by side. Looks they have been there quite awhile! I would say there's been a lot of history and memories made here. Obligatory pic from Hyner View. The one thing that was nice today... and will soon be gone... is the lack of any leaf cover. With a view like this, you could see all the contours of the mountains and valleys, the logging roads, and trails that will soon be covered. You could see much further into the woods as you rode along, deeper into the valleys, and higher on the hillsides. Nice to be able to see the streams 100 yards below you! Then there was this, Spring may be here, but still reminders of the past. Then there was this... best thing I found all day. Riding along watching off the road and downhill to my right, I caught a quick glimpse of this. Stopped and rolled back to get a better look. Would love to know the story behind 'Yock'... and his buddies that thought so much of him to put up this little memorial. And I almost started off again... when I noticed this hanging on the small tree. My 120 miles today pales in many riders eyes.... but those 120 miles were on the BEST Roads in PA.
Knuckle Buster, Lucas71, disconnected and 3 others like this. Thanks Dave, glad you enjoyed them! I have every intention to keep adding to them! Thanks for the trip down memory lane. Born and raised in PA and I don't get back as often as I'd like. Folks are still in Forkston, PA so I do get back occasionally on the KLR650. Your BEST area is indeed an awesome section of PA to ride/camp. Look forward to seeing more from your travels. This looks to be the start of an awsome thread !!! Pennsylvania has so much wonderful terrain and riding opportunities. Have rode and camped some of it myself including Hyner View, Elk Country, Grand Canyon and Cross Fork just to name a few. Some of the biggest Black Bears in PA too. Great start, keep it comin !!! Thanks for taking the time to do this thread. 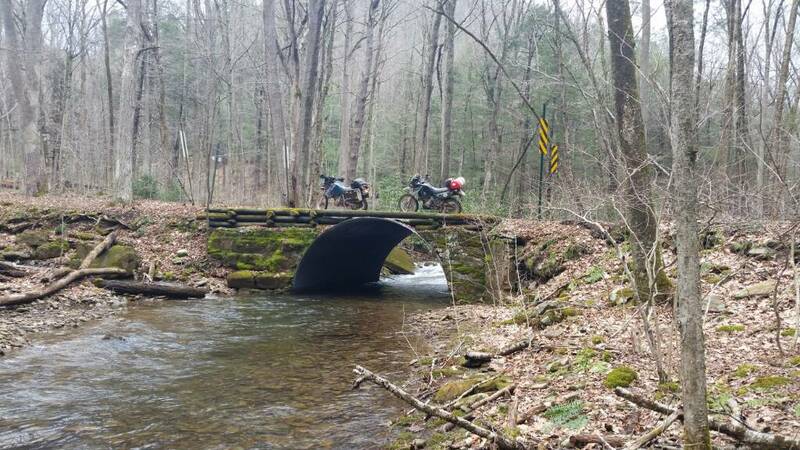 Some of the best moments of my cross-country rides in years past were had in PA, which makes me all that more interested. And to hold you over till I get out again, here's the thread I started last year. It featured Sproul SF, which isn't too shabby by itself! But I wanted to expand my area this year, thus the new thread. Yesterday was forest road riding. Future rides might include small towns, farm fields, maybe even a person or too! I'm not much for big group events or rides, but don't mind meeting up with other riders when there's food involved! And when I'm out on these rides, I'm not adverse to trying out little restaurants, so will be some pics of those places too! Anyway, take a look at last year's pics if you want. Great pics! Looking fwd to more. I rode Big Springs road in Saturday located in Tiadaghton. You can find Bull Run Vista and Ramsey Vista plus a lot of natural gas wells. I'm loving the DR650 which I picked up in December. Scootac I get up to Ole Bull SP every year to visit my parents who are camp hosts at the park and love riding up there. I will have to look you up this year and do some riding and try one of those little restaurants, my treat of course in exchange for your knowledge of the area. Sugar Camp is a bit rocky but passable. Good times! Scootac, Almost brought the bike up last weekend and was going to shoot you a PM about riding. When I get time to get the bike up I will let you know and meet you somewhere to do some exploring. Well, I had thoughts of riding on Sunday... maybe grab a dirty tag, find some new roads in Bald Eagle SF, get some pics of guys fishing since Saturday was trout opener here. But.... the honey-do list came up. She wanted to go shopping and needed me to drive the truck. She did more than just look. She's been riding an ST1100, but wanted something lighter and lower. 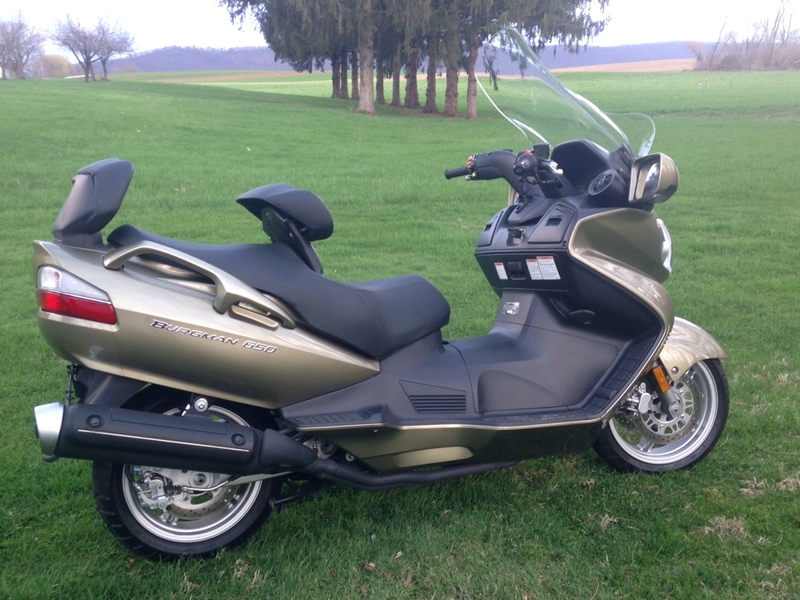 No cruisers though, and still wanting the protection of a fairing and decent luggage capacity. By all accounts, this should do it. Sooo.... you'll probably see this bike in some of the future posts. Give me time.... there will be more!!!! Montana Maniac, thechief86 and pnoman like this. OK, finally got out again for a few hours! Main reason was to grab a dirty tag, but found some new roads and took a few pics. Tag was in Bald Eagle SF, and was to be dropped there too.... but I found out I dropped it in Tiadaghton SF! :huh Oops!!! Anyway, a short, but nice ride! I know some fellas that would get a LOT of shooting if a deer happened to run through this! I had an Uncle that just loved teaberry ice cream. Happened to look down and found these little nuggets where it would all start. Bonus points to the first one to guess what I'm tracking here. Can often be spotted Saturday evenings and Sunday afternoons. Then I came across this. It almost made me feel unwelcome! Also... befuddled me that DCNR was 'in conjunction with' a private club. What da 'ell does that mean??? On the way to the tag grab, I saw a turkey cross the road out in front. Too quick for a pic. But this one went off the side of the road, back out to the middle, then just trotted away from me, allowing me to get at least a poor pic. And note that he's running into the posted ground!!! Then I found a nice little stream to follow for a bit. That's one nice thing about this area... a lot of roads follow along streams and creeks. Which means nice views like this! And not just little forest roads like this, but county and state roads too. So, with a little bit of walking, fairly easy to get some decent pics. And finally, took this road to drop the tag. Which ended up being in the wrong forest! So that was my ride for today. And that's what's nice about this area... and having a DS bike. I rode maybe 60 miles, only took a couple hours, and still found new roads and sights! black top bob and thechief86 like this. The buggies around here leave those marks in the asphalt! I was going to put a pic of road apples too, but I didn't want to scare the city folk away. Often times on a Sunday I'll see horse and buggies out on the gravel forest roads.... families or just a young couple going courting! And you can redeem your points....wherever you can! Had a very good day riding today, but not one pic. After bringing the Burgman home, have only found one evening to go to a parking lot for a bit of practice with it. But she finally said, "I want to go riding Sunday!" So we set out about 10, first stop for the first gas fill-up. Then over a twisty 445 to Millheim. I pulled over to see how it was going... If needed to go home or keep going. She lifted her tinted shield and had a big smile on her face... "This is FUN!" OK, need to make a bigger loop out of this! Head east on 45 then stopped at a Henrys for a drink. Sitting outside on bench partaking, two guys in a pick-up pull in, first guy out has hip boots on. 2nd one, a short fella, slides down out and looks at us and sez "New BMW?" I say "the blue one? No, a Honda and a Suzuki"
He then sez "Oh, Harley here... I like to count cows" Uh-huh...okaaaayy. So we go again, heading for Pine Creek. She gets more practice thru Mifflin & Lewis burgs, then up 15 a bit to hit more 2 laners. Across to Jersey Shore, lunch at Venture Inn, on up to the Pike and then south on 664 and back to home. Maybe 120-140 miles today, but I think she's really liking the bike. Low enough to flatfoot it and light enough to be able to back it up in a gravel parking lot. CG is lower so it feels and handles even lighter! Soooo....if she likes it, and wants to ride more... the better life is!! !